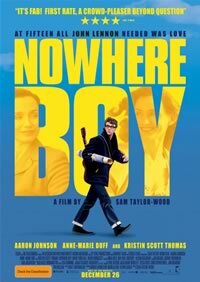 An emotionally charged family melodrama masquerading as a rock n' roll biopic, Nowhere Boy is a riveting portrait of John Lennon's late teen years in Liverpool, just before the Beatles. Based on a memoir by Lennon's half-sister Julia Baird, first time director Sam Taylor Wood has put together a superb period piece, free of nostalgia and largely faithful to the biographical record. The film focuses less on Lennon's first steps toward stardom than his first steps toward emotional maturity.